Game/Match Over: Whenever the current game is over, use the menu options to select the ‘Game Over?” function (See Figure 1). 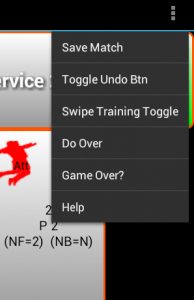 Selecting this option will bring up a second dialog (figure 2) which asks whether the game is over. , the match is over, or do you want to cancel and go back to the stat inputting screen. Selecting the “Yes – Match over” button, will end the match and take you to the main menu screen. Selecting the “No – Start New Game” button will open up the player / court allocation screen. This screen provides the same functionality of assigning players to court positions used when starting a new match with the exception of the libero. The libero position(s) is fixed for the match. NOTE: In some organizations, the libero position can be changed between games. In order to accommodate this, by performing a long press on the libero position, you will be asked if you want to remove the player/libero from the court. If answered ‘yes’ the libero will be removed and the libero can now be reassigned. If a player’s lineup was saved prior to this point, the lineup can be retrieved by using the menu option to “Retrieve Lineup”. As before, once a full court is assigned, the rotate button is provided so that a basic lineup can be saved and then rotated. Once the lineup has been created, the “done button can be used to go start the next game in the match. As before in starting a new match, who serves and what rotation needs to be answered before that stat taking can begin.